Last week, at a dinner event at Black Star Farms, the officials of Traverse Area Recreation and Transportation (TART) Trails awarded the 3rd annual Jim Mudgett Trail Pioneer Award. 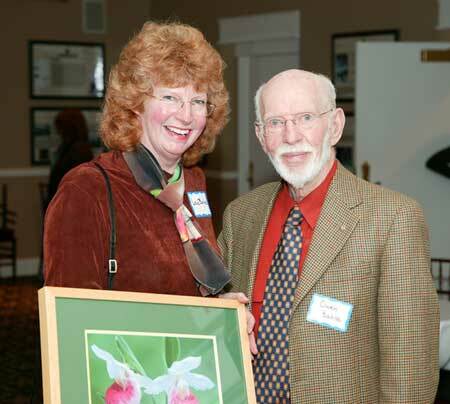 The award was presented to Lois Bahle by past recipient Ted Okerstrom. Lois was involved at the very inception of the Leelanau Trail. From 1995-2005, she served on the board of the Leelanau Trail Association which later became part of TART Trails in 1998. She has been the president of both organizations and helped lead a capital fundraising effort for TART from 2002-2003. She has been involved organizing and promoting events to get people out to enjoy our beautiful area and our trails. She has been described as the "keeper of all things." One of those rare and valuable people that do not only remember everything, but also can put their hand on it. Lois Bahle holding the Jim Mudgett Award pictured with her father, Owen Bahle. One of the quotes from a nomination letter said it best, "I will never forget the first time I saw Lois. She got up in a room full of angry people and spoke eloquently about the need for a trail at a time that it took a lot of guts to say the right thing. Her biggest contribution was persistence and unflappable optimism, grace and courage under fire." Lois Bahle has been a positive force in our area over the years by visioning trails that connect people to other communities, to nature, recreation, and transportation. She has especially been a lightning rod for the Leelanau Trail. "As TART moves forward and continues to advocate for bicycles and pedestrians in the Traverse area, we are always standing on the shoulders of those who have come before, and we appreciate all of the hard work, perseverance and dedication from these leaders," said Bob Otwell, TART Trails Executive Director. "The TART Trails organization would not be where it is today without the foresight and guidance of those who created the dream. Lois Bahle is an incredibly worthy recipient and I'm proud that she has won the award this year. She certainly deserves it!" continued Otwell. The Jim Mudgett Award was created to honor and pay tribute to individuals who have shown leadership and passion for our local trails. The award is given annually at TART's Octoberfest dinner party. "Enriching the Traverse area by providing an interconnected network of trails, bikeways, and pedestrian ways; and encouraging their use."